Last week witnessed several global investment research and media visibility for Tethys Investments. 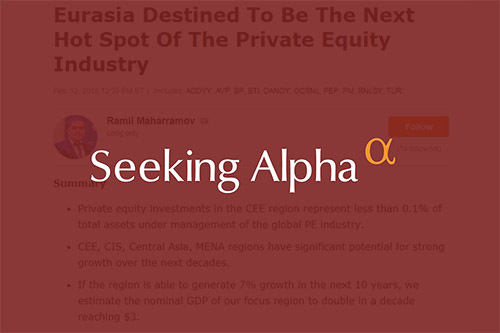 First, the article written by Mr. Ramil Maharramov, Managing Partner of Tethys Investments, titled “Eurasia Is Destined To Be The Next Hotspot of the Global PE Industry” was approved for publication in a highly regarded, international investment research and analysis platform “Seeking Alpha”. It shall be noted that all articles published on the “Seeking Alpha” pass through mandatory editorial review and check. The full article published on the “Seeking Alpha” can be read here. Second, the “Private Equity Wire”, private equity industry's leading portal on news and topical features, published the article about the membership of Tethys Investments to the Emerging Markets Private Equity Association (EMPEA). The article noted that Tethys Investments is the first PE Fund member of EMPEA from the Caucasia region, and the second member from the Caucasia and Central Asia region. You can read the full article here.